I'm bumping up this almost two year old post because there's a recent question about the recipe which I've answered and because I've been thinking a lot about Mexican moles recently. The blogger of the week is from Spain, Cocinalia. To my pleasant surprise cocinalia has a Curso de Cocina Maghrebi. When I think of Spain in relation to North Africa, I think of my days in Oran. One of my favorite cities in Algeria. The most significant culinary interplay between Spain and North Africa begins with the Moors. After more than 700 years of reign on the Iberian peninsula they returned to Morocco, Algeria and Tunisia with Spanish influences that are still evident in the Maghreb. Seventeen years after Christopher Columbus set sail for the Americas the Spanish captured the port of Oran in 1509. Rachel Lauden has written a thoroughly researched piece on The Mexican Kitchen's Islamic Connection. What intrigues for the moment are the moles. The most common ingredients for the endless varieties of mole include: tomato, onion, cinnamon, tortillas, chiles—including anchos, pasillas, mulattos and chipotles—pumpkin seeds, raisins, star anise, cloves, sesame seeds, almonds, tablets of chocolate, tomatillos, oil, garlic, salt, allspice and serrano chiles. Nearly half these ingredients arrived in the New World with the Spanish. 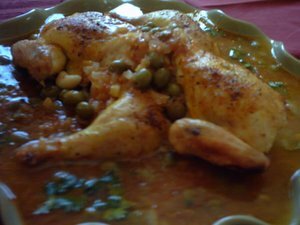 The Spanish also quickly transported ingredients from The Americas throughout the Mediterranean making possible the chicken dish I had in Oran. Actually that's a bit of an overstatement since I recognize only tomatoes and chili peppers as being from the "New World" in the dish. I present a recipe that I've recreated from memory. This baked chicken tagine is definitely for chicken fat lovers. I have an alternative recipe using the same ingredients for a lighter version. The reason this version is rich is because the potatoes soak up the rendered fat from the legs. 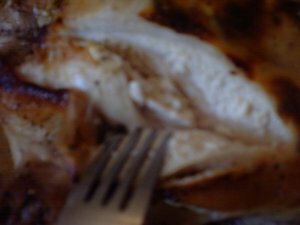 You can bake the chicken separately and drain off the the fat, but you will also have to roast the potatoes separately. I used the bottom of my terracotta tagine with the lid off for this casserole type tagine. A tagine of chicken with olives and preserved lemons isn't a recipe so much as a list of primary ingredients that go into a range of braised, stewed or baked dishes with seemingly endless variations. I used manzanilla olives for this reipce and I roasted it in the oven. This is "a weeknight after a long day at work" tagine. Have I mentioned already that I work 12 hours a day? Some days up to 18 hours? I have no desire, energy or the time to spend slow cooking a tagine after a long day at work. The prep time for this recipe is about 10-15 minutes, preheat the oven while putting all the ingredients into the dish, pop it in the oven, baste twice and your done. While the chicken dish is cooking I usually help my daughter with her French homework or check soccer scores on the internet. I served this tagine with a round, leavened bread that I bought at an Armenian bakery (the best baguette I have found in Los Angeles is at an Armenian store in Glendale and I'm including all the so-called artisanal bakers I've tried in L.A.), a green salad and a chocolate cake I bought at Trader Joe's for dessert. Tomorrow I'm filming a foodcast about the long, slow method of cooking in a conical tagine. I like to offer a variety of cooking methods because that's how I cook. I don't starve myself because I don't have 5 hours to cook a tagine like my Aunt Farida did on our family farm in Setif. This is a very simple recipe. The sauce is mild and delicate. It's a non-recipe really. I cooked 2 whole chickens, but the recipe obviously works with 1 chicken! Spices that work for the dish are my ras el hanout blend, saffron, turmeric, cinnamon or nutmeg just to name a few. You can omit spices entirely and the dish will still be delicious. 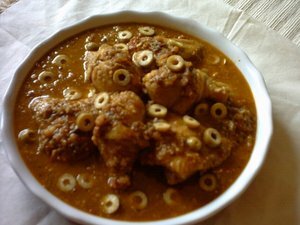 This dish can be cooked using different Algerian cooking techniques for chicken that I've posted before. 1) Put all the ingredients in a big pot with about 1- 1/2 cups of water, season with salt and pepper, add spices if you will be using them.. Bring to a boil, reduce heat and simmer until the chicken is tender, about 1 1/2 hours. Another recipe from last week's iftar made from this mise en place. I have alot of catching up to do this weekend. This is a method for steaming chicken in a crock pot for 6 hours. 1 bulb of kohlrabi cut into 6 pieces. If you don't have a crockpot use the stove top method I describe here. Plating is the same. 1) Layer the vegetables in the pot, add the chickpeas, lightly season with salt, stir, add the chick peas and 1 1/2 cups of water. 2) Sprinkle about 1 tablespoon of salt evenly on the chicken and rub in the spices. If you don't want turmeric stained fingers wear gloves. 3) Place the chicken pieces on top as shown. Cover and cook push the cook for "6 hours on high" button. This is my first crock pot and I as sit here typing this I wonder what the settings are on other crock pots. I will find out and add to this post. In the meantime if you have a question just ask me. Another dish for Ramadan. Actually all the recipes on my site are suitable for Ramadan. This is a very easy dish to make. It's one of those slow cooked all day dishes that are found in Algeria. It's very flavorful and satisfying. Some cooks will leave a dish like this on the stove or fire all day long, until everything is meltingly tender. This is a very simple, but elegant and delicious dish. Steaming the chicken gives it more flavor and a superior texture compared to simply boiling it. The juices from the chicken drip into the turnip and carrot soup underneath giving an added dimension of flavor. Traditionally this dish is prepared in a three tiered couscoussier with freshly hand rolled couscous on top. I don't have a three tiered couscoussier, I do have a tri-level metal fish steamer I bought at a Thai Market, unfortunately my stove has an oven directly over it, so I could not make couscous at the same time. On the Zadi family farm in Setif we ate chicken a couple of times a week and lamb the rest. The chickens on the farm are of course totally free range feeding on wheat, corn, worms and insects giving them a special flavor rivaling or exceeding the artisanal produce of more developed agricultural countries. The chicken is eaten the day it is slaughtered. The flavor is intensly meaty and might even be shocking to those used to common supermarket birds. The most fundemental method of cooking chicken in Algeria is on a spit over an open fire. The chicken is simply seasoned with salt and generously basted with extra virgin olive oil, butter, samna or smen, creating an incredible crackling like skin. I do not have the means to cook like this in my home in Los Angeles. So I devised an oven method for reproducing djedj mechoui in an oven. If you don't like spices and herbs just omit them. As I've already stated the spicing doesn't make it more or less authentic. The cooking method is all about the crispy, crunchy skin. When properly made you can actually here the skin breaking like a cracker. Chicken with Preserved Lemons and Olives is possibly one of the most famous dishes of the Magrheb. The name itself seems to evoke a distinct culinary image of North Africa. I can think of at least eight different Algerian variations off the top of my head without looking at my cookery notes. I chose this one to present first because I've noticed that variations of Chicken with Preserved Lemons and Olives are increasingly popular on the menus of non-North African restaurants. Rather than an insipid chicken breast in a pool of flavorless sauce I propose this recipe. It is wholly authentic and absolutely delicious. It can be presented as "Half Roast Chicken with Preserved Lemons and Olives" in typical bistro fashion.